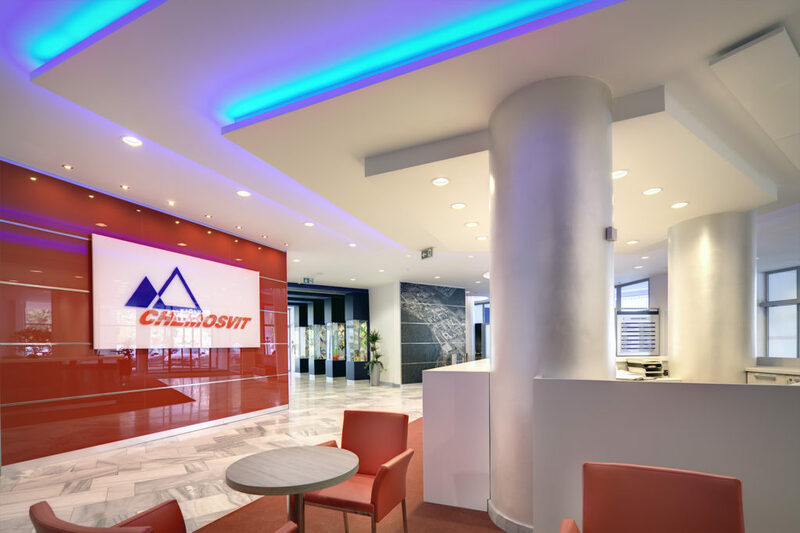 The public company Chemosvit belongs to one of the most successful companies in Slovakia. With its large production volume, it is also one of the biggest employers on our market which delivers its products also on international level. The HQ of this company has entrusted us with a thrilling task: to reinvent the design for its exterior, entry hall and also the office space interior. In the area of exterior we have implemented an inclined platform so that we could create a barrier-free access for people with a disability. This simplified access also continues in the inner spaces and was considered also in the overall interior layout. Exterior design of the office building has simplified its facade and accentuated its main entry point. The entry hall reconstruction in the headquarter of Chemosvit has been a challenging task for us and also a big responsibility for creation of a representative environment for business. In pursuit to design a timeless interior we have strived for a modern idea concept and an original interior project. This has included also a spacial und functional update of the previous room layout. A new interior solution has provided the entry hall with more space and in the area that previously belonged to exterior we have added also a light conference room. Moreover, we have changed the shape and set-up of the window cases and in the main entrance area we have placed a gate with automated opening. 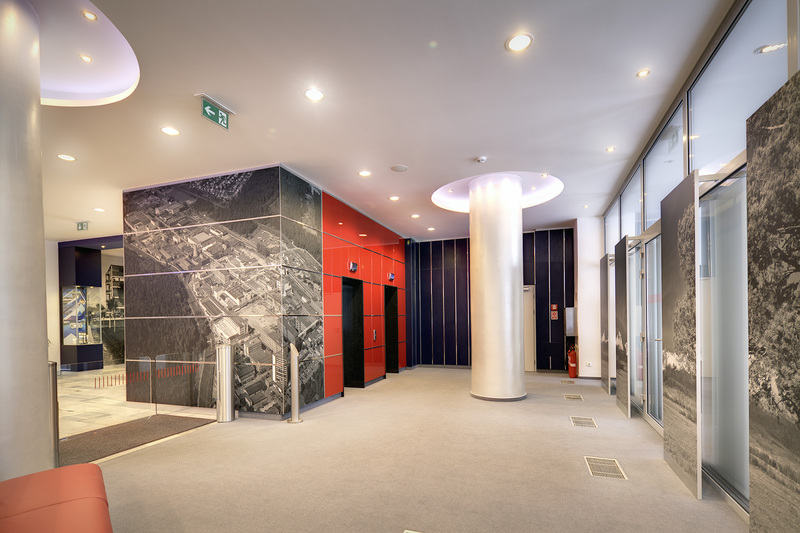 We have situated the decorative showcases in an area that was previously not very effectively used. These atypical interior elements are complementing the overall interior design and perceived room atmosphere. We have shifted the atypical reception counter into the very center of the hall. Thanks to this positioning, the company’s staff can easily oversee the happenings in the whole interior space. The area of stairs was visually and functionally separated with a gypsum plaster-board. In doing that we have achieved a regulated movement of company’s visitors. Close to the elevators we have placed a very elegant glass gate equipped with a card system. On the two neighboring walls next to the elevator entrance we have used large-screen photos of black and white aerial shots picturing the whole Chemosvit lot from above. We have surrounded the elevator entrance with simple portals made from stone. These were decorated with a stunning glass surface lacquered in red color. 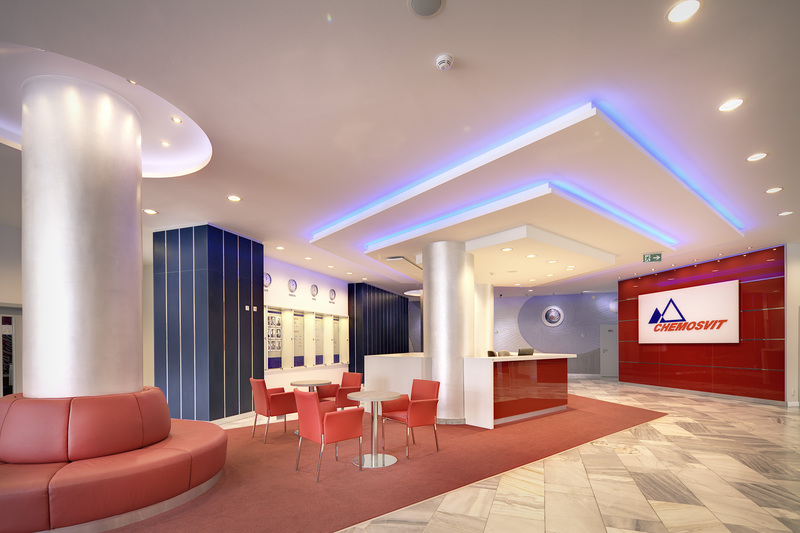 This material was also employed on the reception counter and on the wall area behind, where we also have placed the company logo. When choosing the color palette for interior blueprint, we have considered mainly the utilization of colors employed in company’s branding strategy, which are red and blue. As an example for interior elements made in brand colors, we have picked wooden panels in dark blue. This way we have created an authentic wall covering. Various direct and indirect lighting elements take care of a proper level of brightness in the entry-hall. A special focus was invested into highlighting chosen architectural elements and details. A multi-level gypsum ceiling amplifies important interior parts, such as the connection between decorative showcases and the opposed wall areas. Another good example in this context is the reception space. Double-layered circular ceiling elements surrounding the columns create the impression of their free continuity into another floors of the building. Their mass is accentuated and visually toned by the lighting placed around them. On the surface we have used an irregular color structure coated in silver finish.